Apollo 12 lunar module pilot Alan Bean steps down to moon's surface during his 1969 flight. NEW YORK -- Hundreds ofastronauts have launched into space, but only a select few have looked backupon their home planet Earth from the Moon. ?In the Shadow of theMoon,? a new documentary that opens this week in New York and Los Angeles,tells the human stories of NASA?sformer Apollo astronauts ? now in their 70s ? who circled or landed onEarth?s nearest neighbor between 1968 and 1972. ?It?s an extremelysimple film,? British director David Sington told reporters this week. ?It?skind of like an astronaut?s home movie.? NASA first sent astronautsaround the moon during the December 1968 flight of Apollo 8, then landed NeilArmstrong and Edwin ?Buzz? Aldrin on its Sea of Tranquility on July 20, 1969, winning theSpace Race with the former Soviet Union. Five more moon landings, and the abortedApollo 13 attempt, followed. With the support of ?Apollo13? director Ron Howard, Sington interviewed astronauts from each of NASA?slunar missions spanning Apollo 8 to Apollo 17, and combed through the spaceagency?s video archives for unseen film that was later remastered in highdefinition. The resulting 100-minute film, pared down from 60 hours ofmaterial, is a compelling glimpse into the humanity of NASA?s moon-bound Apollocrews. "To me, this filmcaptures the emotional side of the space program, which we never discussed. Itwas all technical stuff," Apollo 16 lunar module pilot Charlie Duke toldreporters. "I don't remember once, at any of the briefings, anybodyasking, 'Well, what did it feel like?'" Duke likens his lunar trekto being a five-year-old and able to celebrate your birthday, Christmas and everyholiday in between at the same time. "It's such a uniqueexperience, that there's nothing you can compare it too down here," Dukesaid. "The excitement and the enthusiasm that one has there, at least inmy case, is really difficult to describe. It's an awesome experience." 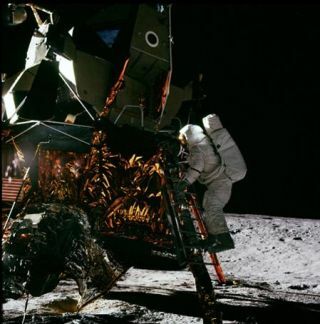 "Your neck was out sofar, you're literally betting your life on all that hardware," said AlanBean, who served as lunar module pilot on the Apollo 12 mission in 1969. Bean dubbed himself one of NASA'smore fearful astronauts and in the film describes his worries that a capsulewindow could blow out during the three-day trip to the moon and cripple--orend--the mission. "I wanted those threedays to collapse down to 10 minutes or something because I was always afraidsomething would break. And it did on the next flight, Apollo 13," Beantold reporters. "You want to be there, you're glad you're there, but youwant to come back home." It's perhaps fitting thatSington's documentary debuts this year, which will see the 50thanniversary of spaceflight on Oct. 4, the day the former Soviet Unioninaugurated the Space Age by launching the first-everartificial satellite - Sputnik - into orbit in 1957. Aldrin, the second humanever to set foot on the lunar surface, credited Sputnik?s launch with spurringthe U.S. to send astronauts to the moon. But it was only years after thathistoric flight with Armstrong and command module pilot Michael Collins that hewas able to reflect on the experience, Aldrin added. ?I think it was a universalstory,? said Sington, adding that every time he looks up at the moon heremembers that 12 humans once walked across its surface. ?It was an Americanachievement, but it was a global event and it?s something that people remember allaround the world.? ?In the Shadow of the Moon?focuses most of its attention on Apollo 11?s success, with relatively littledetail on the particulars of subsequent flights or their science goals. But theexperiences of NASA's Apollo astronauts ring clear as a bell. ?Theexcitement for me was to explore to find out, to discover something new and tocome back and tell folks about it,? said Edgar Mitchell Apollo 14 lunar modulepilot. ?That?s what explorers always do, and we were privileged to be part ofthat vanguard of explorers to take a look at our nearestneighbor.? Sington and the Apolloastronauts do have final message for any remaining skeptics who still maintain,nearly four decades after the first Moon landing, that NASA hoodwinked us allwith snazzy special effects on a movie soundstage. "We went to the moonnine times," Duke says in the documentary. "Why would we fake it ninetimes?" ?In the Shadow of theMoon? opens inthis week in New York and Los Angeles. Clickhere for more cities.